2019-01-28. There are currently 3 requests in the shipping queue. New varieties of note this year are the high carotene sweet and flint corns. Also a new flour corn. Corn with air-roots is this year's newest fad, so I saved seeds from plants with that trait. The tepary beans were amazing this year. About half of the seed are 2nd, 3rd, and 4th generation from hybrids, so they are really shining regarding local-adaptation. I'm really happy to be able to share seed from the promiscous pollination project.I loved the fruity exotic tastes, because I really don't like the taste of domestic tomatoes. It's still a really rough draft. I received a wonderful grow report regarding blight tolerance of the interspecies crosses and their wild ancestors. The excess seeds grown on my farm are available to home gardeners, small-scale farmers, and public-domain open-source plant breeders. I am growing promiscuously pollinated (PP) locally-adapted landrace populations that are specially suited to thrive on my subsistence level farm with it's unique climate and pests: irrigated desert, super-dry air, sunlight-drenched, cold radiant-cooled nights, short-season, no pesticides nor fertilizers, sporatic weeding, high-altitude clayish limestone-based lake-bottom soil, and philosophy towards diversity. The more of those conditions you share with me the better my seeds are likely to do for you. My seed is most suitable for growers who live close to me and share a similar climate and philosophy towards growing. All of my varieties have been developed for organic subsistence level growing conditions without the use of cides nor fertilizers. 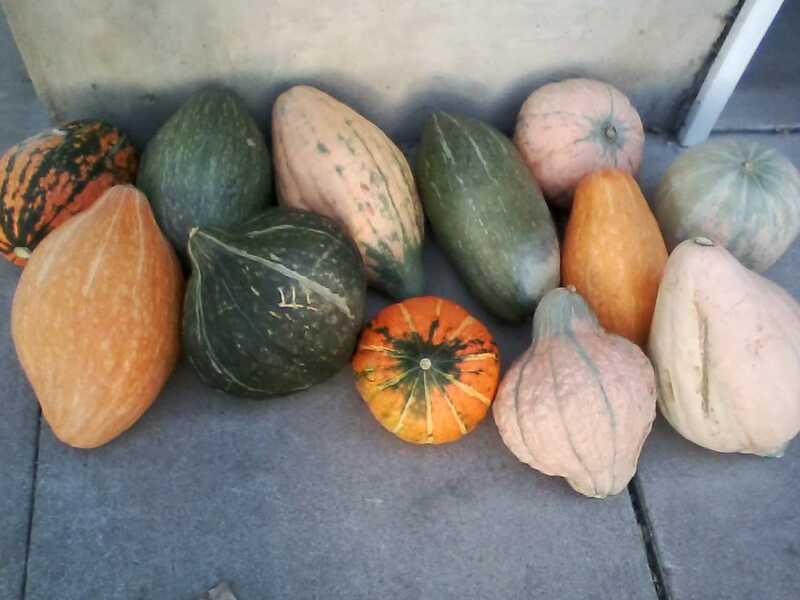 Home gardeners, plant breeders, and small-scale market growers who welcome diversity of shape, taste, texture, color, size, and maturity dates may love my seeds. 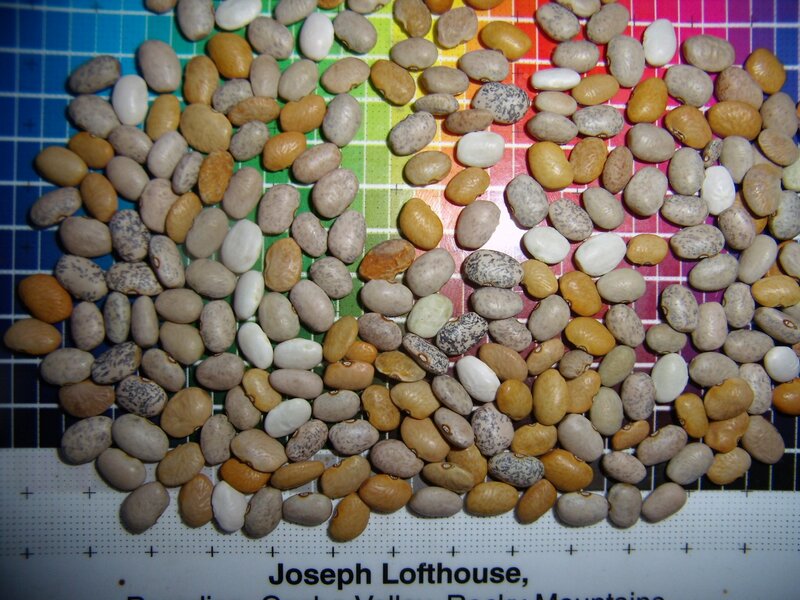 My seeds are unsuitable for commercial farms or large operations that require uniformity, predictibility, or stability. My seeds are especially suitable for seed savers who want to develop their own varieties or to diversify their current landraces. Due to the wide genetic diversity, these seeds make an excellent emergency seed stash. 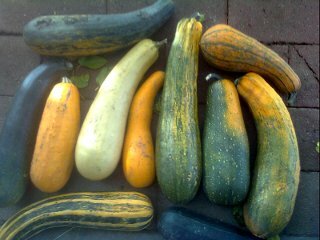 There is so much genetic diversity among my seeds that some family type or other is likely to thrive wherever they are planted. Save the seeds and select for those families that do best in your conditions. Genetically diverse crops have a much better chance of adapting to ever changing weather and pests. The foreign climate that has most surprised me where my varieties tend to do well have summers that are so blazing hot that vegetables tend to croak in the heat. My varieties are typically short-season, so when planted early in the spring or later in the summer, they may produce a crop before or after the worst of the summer heat, storms, and pests would ruin a longer-season crop. One southern grower tells me that he loves short-season crops, cause the longer a crop is in the ground, the more chances there are for something to go wrong. I love grow reports, and taste reports. Recipes are lovely. Negative reports are particularly valuable to me because they give clues about what traits to work on during the coming years. If you post feedback in a public place, I may link to it or share it to bring more traffic to your post. Tagging me on Facebook, or posting to my wall is a great way for me to find your grow report. usa shipping is $5 per shipment which covers postage and a bubble envelope. If your shipment includes 4 or more packets of corn or beans, or more than about 20 packets total, please send a few extra dollars towards postage. I have lived under a vow of poverty for more than 20 years, and have operated a food pantry for longer than that. I welcome donations to help me continue feeding my community and being a subsistence farmer breeding new varieties to enhance food security through common sense and traditional methods. Some of my varieties were pledged to the open source seed initiative: You have the freedom to use these OSSI-Pledged seeds in any way you choose. In return, you pledge not to restrict others' use of these seeds or their derivatives by patents or other means, and to include this pledge with any transfer of these seeds or their derivatives. All other varieties I offer are public domain. That means that they can be used without restrictions. You are welcome to grow my varieties and sell the seeds. No permission is needed. If you let me know that you are growing my varieties for sale, I may do advertising for you. I ask a 5% royalty as a free-will offering to the plant breeder. If you are a market farmer and use my seed as the foundation for one of your crops, It tickles me if you remember the plant breeder with an honorarium. I typically accept seed requests between January 1st and April 30th. During other times of the year, farming occupies my time. I expect a full assortment of seeds and plants to be available during May at the Logan gardener's market, and I typically take a box containing some seeds to market each week. The list does not contain all of my breeding lines. If you would like seeds from one of my breeding lines, or from something you have read about that is not listed here, please ask. If a variety carries my name, or the name of my village, or family, I have poured my money, time, and soul into developing that variety, and I believe it to be the best possible variety for my garden. I am a human being, sharing my babies. So if something goes awry along the way, I'll do what I can to make things right, as a human being cooperating with another human being. I'm not a business, so shipping depends on my health, and that of my family and tribe, the weather, my travel schedule, etc. I might only make the treck to the post office once a week. Sacred Maize I plant corn about 3 weeks before average last spring frost, or about the time that apple trees are flowering. For sweet corns, I recommend planting successive crops when the previous crop is about 3 inches tall. su. Promiscuously pollinated. Multi-colored. Mid-season (~65 to 75 days). Selected for colorful cobs at milk stage and for resistance to predation by birds and small mammals. It has that fabulous old-fashioned corn taste: Chewy and flavorful without being overly sweet. A robust landrace that is reliable and easy to grow. Developed for subsistence level growing conditions without cides nor fertilizers. An excellent choice for tough growing conditions and for people wanting to save their own seeds or to develop their own variety of sweet corn. I consider this to be the best sweet corn I have to offer for an emergency survival stash. Descended primarily from Alan Bishop's Astronomy Domine Sweet Corn which is descended from hundreds of varieties of heirloom and modern sweet corns. It has been in my garden for a long time, and has drifted significantly away from the original, so a new name seems appropriate. Very tolerant of cold spring soil. OSSI-pledged. 3 Tablespoons, >150 seeds. F1 Hybrid. White or yellow kernels.. (~75 DTM?). The mother of this hybrid is Lofthouse-Astronomy Sweet corn. The pollen donors are Ambrosia or Who Gets Kissed. 25% of the kernels in the offspring are expected to be sugary enhanced. After a decade of trying, and failing, to breed a reliable sugary enhanced sweet corn, I finally found a workable solution. This hybrid combines the thick skin and reliable germination of Lofthouse-Astronomy Sweet Corn with the extra sugar levels in homozygous sugary enhanced sweet corns. Variety preservation protocol: Seeds will not come true to type. Remake the hybrid as needed. 1 Tablespoon, ~60 seeds. su. Promiscuously pollinated. Mostly white or yellow kernels.. (~75 to 80 days?). A sweet corn selected out of a hybrid between Harmony Grain Maize and Lofthouse-Astronomy Sweet corn. This is an experimental corn that I might only offer this year. Eventually, I expect to merge it back into the Lofthouse-Astronomy population. Variety preservation protocol: Cull any red, purple, or gray kernels. 1 Tablespoon, ~40 seeds. I love, love, love the taste of carotenes in my food! Deep orange kernels with high levels of beta-carotene. The best tasting sweet corn that I grow. su. Promiscuously pollinated. A sweet corn selected out of a hybrid between a high carotene South American flint, and Lofthouse-Astronomy Sweet corn. 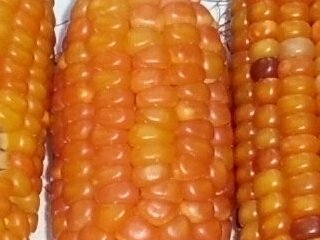 Variety preservation protocol: Cull any cobs with white kernels, or colored pericarp. Cull any red, purple, or gray seeds. I am pleased to finally have enough of this seed to offer a larger packet size. The high carotene trait is an ancient public domain trait that is obvious and not novel, making this trait inelligible for patenting. 2 Tablespoons, >100 seeds. 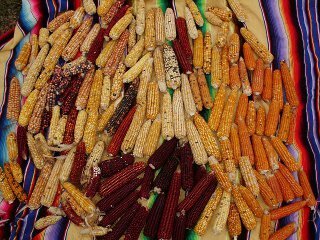 A joyful family reunion between a hybrid swarm of North American grain corns and a synthetic composite of 6 races of South American grain corns: Tuxpeno, Coastal Tropical Flint-Dent, Southern Cateto, Cuzco, Coroico, and high-altitude Andean. Harmony was developed to unify various diasporas of corn and to create a strong genetic base from which to conduct plant selection and breeding. Among the corns that I grow, this population most fully expresses mother maize's role as mother of life, teacher, problem solver, and sacred technologist. Contains flint, dent, flour, pop, and a small amount of sweet corn. Adapted to temperate growing conditions. Not day-length sensitive. About 85 to 115 DTM to grain stage. High resistance to predation by birds and small mammals. OSSI-pledged. 3 Tablespoons, >100 seeds. A sister line selected from Harmony grain corn. Soft kernels that are particularly easy to grind or mill. Very suitable for making hominy and masa harina. More susceptible than harmony to predation by birds, small mammals, and insects. About 85 to 115 DTM to grain stage. 2 Tablespoons, ~80 seeds. A sister-line selected from Harmony Grain Maize. An ancestor was Cateto, a South American race of corn with high carotene levels. The most exciting trait offered by this corn is high concentrations of carotenes. If this corn is fed to poultry, the carotenes end up in their eggs. So colorful, and Mmm Mmm Mmm! Selection is ongoing for oranger coloration. 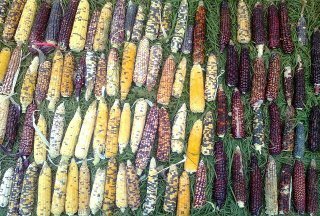 Variety preservation protocol: Cull any cobs with white kernels or colored pericarp. Cull any kernels with purple or gray coloration. Selected by Joseph Lofthouse in collaboration with ten-thousand years worth of illiterate plant breeders. The high carotene trait is an ancient public domain trait that is obvious and not novel, making this trait inelligible for patenting. 2 tablespoon, ~120 seeds. This year's hottest fad in corn breeding is air-roots, after a study reported that air-roots harbored nitrogen fixing microbes. I went through a couple of my corn patches, and saved seed from any plant which had air-roots. I don't have a lab, or any way to confirm if the microbes were present. I suspect that the association is widely dispersed through older corn varieties, and is not specific to the one variety studied. Perhaps one reason this trait has been selected against in commercial corn varieties, is because the roots form a knot that doesn't break down nor till in easily. Selected by Joseph Lofthouse in collaboration with ten-thousand years worth of illiterate plant breeders. 1 tablespoon, ~45 seeds. Short season, landrace tepary beans. About half of this seed is recently descended from hybrids (F2, F3, F4), therefore the genetics are still rearranging themselves and making all kinds of amazing new varieties. I have selected for pods that do not shatter in the field, but that shatter easily after harvest. 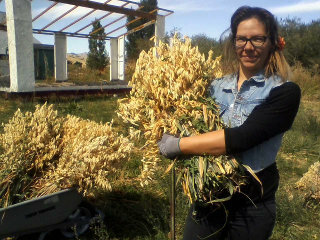 To harvest I recommend pulling the plant whole and hitting it against the inside of a garbage can. Avoid picking individual pods due to shattering. I also harvest by cutting the vine off just above ground level, finish drying on a tarp, and then beating or stomping the vines to release the seed. Selected by Joseph Lofthouse. 1/2 Tablespoon, ~50 seeds. Out of seed until fall 2019. 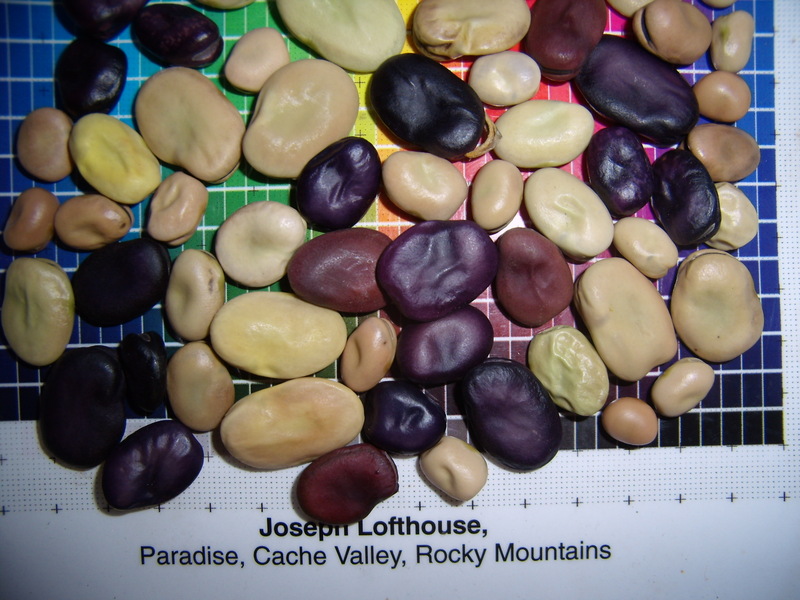 I recommend planting Favas in Cache Valley, the day the snowcover melts in the spring, about the second week of March. Three week old seedlings may also be planted out at that time. Favas don't set seed well in hot weather, so the quicker they get established in the spring, the more likely they are to set seeds. Planting so that they have mid-day or afternoon shade may help productivity. I'd love grow reports about plantings in mid to late summer, and whether they can make a crop before fall frosts. Growers in warmer climates, USDA Zone 8 or warmer, may get best results by direct seeding in the fall. This year's selection tended towards more broad beans, and fewer horse/pigeon beans. Bred by Joseph Lofthouse. ~25 seeds. A great tasting muskmelon with a heavenly aroma and taste: musky, sweet, and soft. An unsophisticated eater might not even realize that this is the same species as what restaurants and grocery stores sell! Best picked just as the fruits are starting to turn yellow, and when the fruit slips from the vine when pulled gently. Limiting water after the first fruits start to ripen leads to higher quality. Developed to thrive under subsitence level growing conditions without cides nor fertilizers. Adapted to a short-season cold-nighted high-altitude mountain valley. This variety has done well in hot climates because it comes on early and produces fruit before the worst of the summer heat and diseases. ~75 to 90 days. Orange fleshed. Netted skin. Fruits about 3 to 5 pounds. Direct seed after danger of frost has passed. 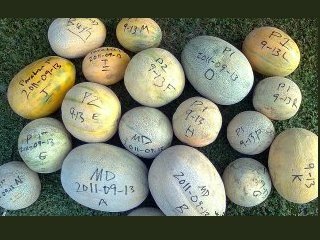 Descended from about 80 named varieties of cantaloupes and muskmelons. Bred by Joseph Lofthouse and Susan Oliverson in Cache Valley Utah/Idaho. OSSI-pledged. 1/2 teaspoon ~30 seeds. This landrace is the result of a decade-long breeding project involving around a dozen growers, about 300 named cultivars, and thousands of new promiscuously pollinated hybrids. There is lots of variety in shape, skin color, and size. I have selected for mostly yellow-fleshed fruits because they are sweeter tasting under my growing conditions. I recommend soaking seeds for 16 hours prior to planting, sowing heavily, and that slow germinating or slow growing plants be culled early in the growing season. Pre-germinating the seeds in pots of coconut coir or vermiculite is a good way to screen for quick germination. (I'm serious that you should chop out any plants that germiante or grow slowly.) Plant after danger of frost has passed. Fruits about 5 to 10 pounds. ~90 DTM. Bred by Joseph Lofthouse with major contributions from Andrew Barney, Susan Oliverson, Alan Bishop, Diane Speed, Soren Holt, other collaborators, and 10,000 years worth of illiterate plant breeders. Seed is limited, so I'll only send one packet per person. ~25 seeds. Fruits around 5 to 15 pounds. Promiscously pollinated. Selected for: Short season, great taste, dry flesh, soft leathery skin, medium sized fruits, productivity, and long storage. These have been grown for many generations without crop protection chemicals nor fertilizer. So they thrive in spite of our bugs and diseases. This is a sister line to my small-fruited maxima, so they may be planted together. About 90 DTM. Bred by Joseph Lofthouse. 1.5 tablespoon, ~35 seeds. Contains mostly bush types with a few percent semi-sprawling type vines. Fruits may be green, yellow, orange, tan, or striped. Bred by Joseph Lofthouse. ~40 seeds. 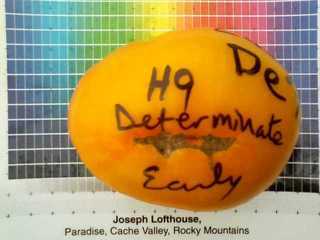 A genetically diverse cucumer landrace. Dual purpose so can be used for fresh eating or pickling. The skin color at fresh eating stage is light yellow to dark green. Seed saving protocol is to taste a piece of the skin from near the stem, and then only save seeds from non-bitter fruits. Bred by Joseph Lofthouse. OSSI-pledged. 1/2 teaspoon, ~40 seeds. A small yellow cucumber that I grow for Barney Northrup of Crumb Brother's Artisan Bread to use in making fermented pickles. Fruit size and plant size are both small. It produces a lot of fruits. 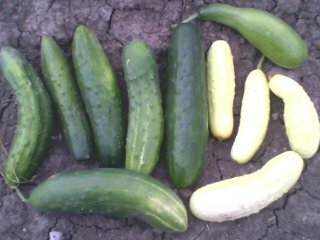 I don't particularly like growing inbred varieties, so I grew this seed in the same field as my landrace cucumbers. I expect about 5% cross pollination. . . 1/2 teaspoon, ~40 seeds. 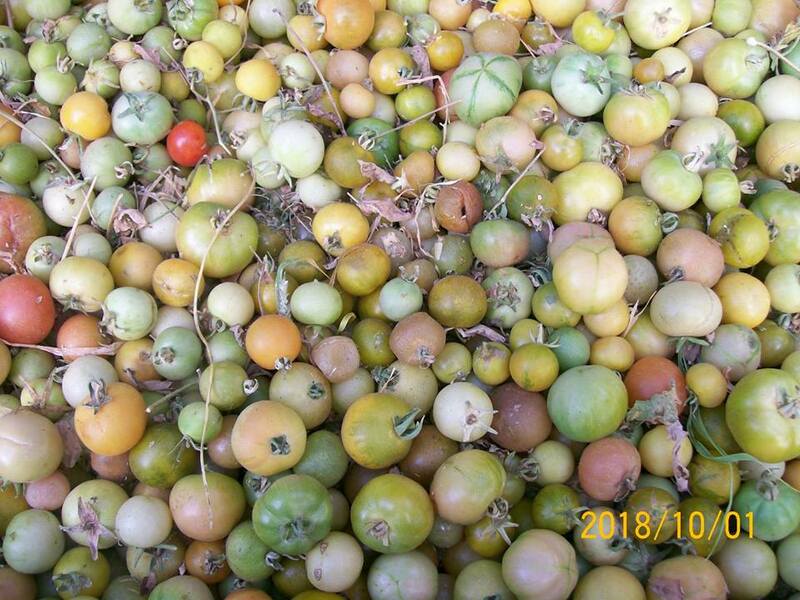 Tomatoes & Kin I am selecting for landraces and promiscuously pollinating tomatoes. I am releasing segregating hybrids. Therefore, offspring may differ from the following descriptions. 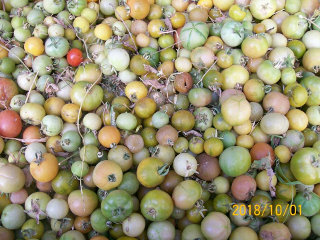 I taste fruits from the domestic tomatoes before saving seeds from them, therefore, the taste is good (if you like raw tomatoes). I eliminated the commercial "cardboard-like" genes a long time ago! Big Hill tomato was my first attempt to breed a promiscuously pollinating tomato. The anther cone is open and the anthers are loosely attached to each other. The stigma is exposed. It has a bold floral display, and the flowers are open to the sky and not buried in foliage. Determinate. 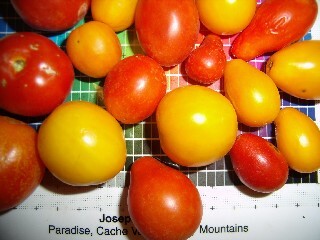 Large (12 oz) bi-colored fruits: red and yellow. Tastes great. Big Hill is fairly susceptible to cross pollination. Promiscuous pollination is a defining characteristic of this variety. Closed flowers are a dominant trait. Therefore any offspring that have closed flowers are off-type and should not be called Big Hill. I would love to receive seeds from any descendents of this variety that are off-type or have closed flowers since they are hybrids and would further my breeding project. The ancestors of this tomato are Hillbilly, which has been my life-long favorite tasting tomato, and Jagodka, which is my earliest market tomato. Big Hill represents the best traits of each ancestor. Bred by Joseph Lofthouse. OSSI-pledged. ~20 seeds. Segregating hybrids from a cross between Yellow Pear and Brad. Brad is tied with Jagodka as my earliest tomato. Yellow Pear is famous as the tomato that the spouse that doesn't like tomatoes will eat. Indeterminate. Fruits might be red or yellow. Fruit shape/size might be pear, cherry, or saladette. Leaf shape is expected to be 1/4 potato-leaved, and 3/4 potato leaved. This is great breeding material for people that want to develop their own varieties of saladette or smaller tomatoes. 1/8th teaspoon ~60 seeds, so you'll have lots to choose from. Wild Tomatoes and Interspecies hybrids I am using wild species of tomatoes as parents to interspecies crosses between domestic tomatoes and wild tomatoes. I am hoping to incorporate disease resistance, beautifully promiscuous flowers, and larger-fruited tomatoes. 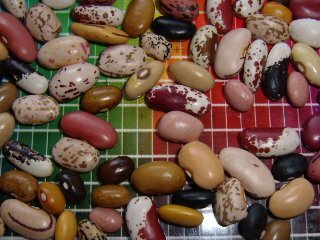 I am releasing seeds from my breeding projects as soon as I have sufficient seed, hoping that other people will develop wonderful varieties of their own. If nothing else, some of them are gorgeous in a flower garden. I grow the wild tomato species and hybrids close together hoping for interspecies hybridization between them. The taste of the wild tomatoes and hybrids with wild tomatoes are highly variable, from super-sweet and fruity to spitters. Taste is best if they ripen for a month after they fall off the vine. Germination of the wild tomatoes and crosses can be erratic. I'm including enough seed in the packets to try to compensate for that. Successive flushes of germination may happen every few weeks. The largest-fruited, earliest, most productive tomato to emerge from the Gnome Family of the Wildling Interspecies Hybrid Swarm. This doesn't have any of the traits desired for the promiscuous pollination project, but it was such a nice variety that seeds were saved separately. 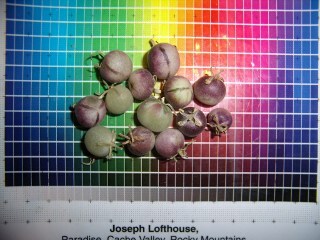 Genetically, this is half domestic, and half Solanum habrochaites. 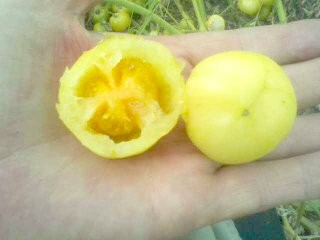 Fruits were yellow and hollow, similar to a pepper. 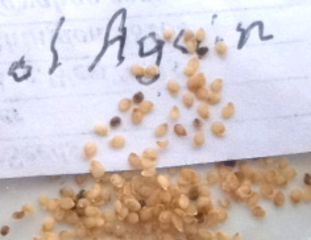 During germination testing, 1/3 of the plants were potato-leaved, leading me to believe that Brad was an ancestor. Brad is tied for first place as the earliest tomato in my garden. These are F4, and set fruit easily, so I think that the mother was self-compatible. Taste is fruity, in other words, it doesn't taste like a typical domestic tomato. Because this is experimental, and from an interspecies hybrid clan, germination may be erratic. Pinch of seeds. If you would like to explore the tomato genome for sweet, fruity tasting fruits, this would be an excellent place to start! 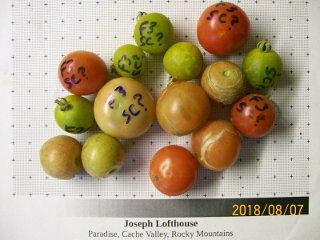 3rd to 4th generation seeds from crosses between domestic tomatoes (50%) and Solanum habrochaites (~35%) or S pennellii (~15%). These are part of the polyamorous, and panamorous tomato breeding project. The end goal of this project is beautifully promiscuous tomatoes. This is a muddled assortment of genetics. Leaf shape can be anything from potato-leaved, rugose, regular-leaved, habrochaites-leaved, fern-leaved, pennellii-leaved, etc. Fruit color might be green, pink, red, yellow, white, or purple. Some fruits are striped prior to ripening. Mostly cherry tomatoes, though some fruits in later generations are expected to attain 8 ounces. Up to a quarter of the plants may be determinate, the others are indeterminate. Plant size might be anywhere between dwarf and monster. These are a mix of self-compatible and self-incompatible plants. Some plants might be self-incompatible, but have self-compatible flower types, so pollination may be problematic. I am hyper-excited to release this seed because of the tremendous amount of diversity it carries within it. There are all sorts of paths that your selection and breeding might take. I am intending to select for open flowers, exerted stigmas, huge-petals, bold floral display, self-incompatibility, fruity-taste, and larger fruits. One of the parents of these crosses originated at very high altitude. Perhaps some degree of frost or cold tolerance will show up. Descended from inter-species hybrids, therefore germination can be erratic. Large pinch of seeds. Self compatible plants selected from the Wildling Interspecies Hybrid Swarm. 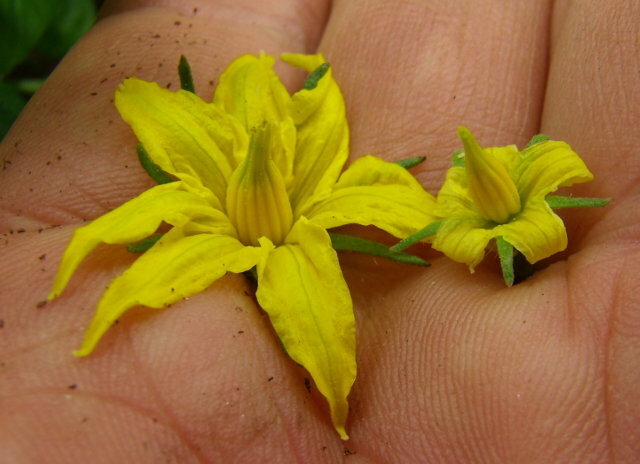 The flowers act like regular domestic tomatoes, and easily self-pollinate. Leaf shape can be anything from potato-leaved, rugose, regular-leaved, habrochaites-leaved, fern-leaved, etc. Fruit color might be green, pink, red, yellow, or white. The mothers were mostly cherry tomatoes. Some fruits in later generations are expected to attain 8 ounces. Includes seeds from Fairy Hollow. Descended from inter-species hybrids with wild tomatoes, therefore germination may be erratic. Pinch of seeds. Self-incompatible plants selected from the Wildling Interspecies Hybrid Swarm. Exerted stigmas. Huge flowers. Beautifully promiscuous. Early. Delightfully fruity taste that has little resemblance to domestic tomatoes. High umammi. The project is already that far along. This year, we are screening for immunity to blights, and selecting for larger fruits. Clusters of big flowers are carried above the foliage producing a bold flower display which earns this tomato a place in a flower garden. Stigmas are highly exerted. These are part of my promiscuous pollination project so there is a possibility that some seeds might have been pollinated by S. habrochaites, S. pennellii, S. corneliomullerii, or interspecies hybrids. Received high scores in spring frost/cold tolerance testing. This is the only tomato that reliably volunteers in my garden. Self-incompatible, so grow several plants together. They can be planted into the same hole/pot. Indeterminate. I am not preserving this variety, A number of accessions were combined together through promiscuous pollination. I am actively selecting for more domestic traits such as larger and sweeter fruits, earliness, and higher productivity. This is a wild species, so germination may be erratic. Very attractive to pollinators, especially bumblebees. Pinch of seeds. 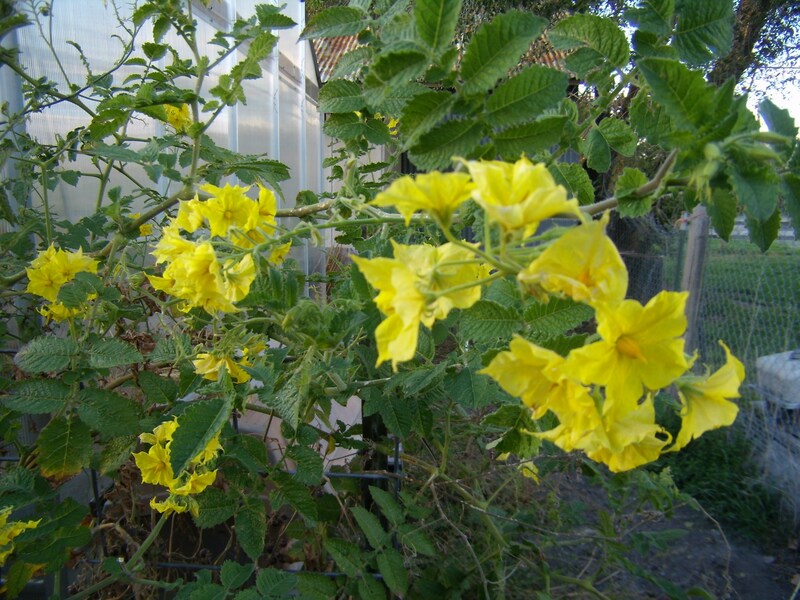 Solanum habrochaites: Closely related to domestic tomatoes, and can act as a pollen donor to them. I have combined multiple accessions into a single population. It has done very well in both spring and fall frost/cold tolerance trails in my garden. It may contain other important traits that were lost during domestication. This population has huge showy flowers, and looks great in a flower garden. The stigmas are exerted for easier cross pollination. It appears that this population is self-incompatible, so a number of plants should be grown together for proper cross-pollination. I am using this species as a pollen donor in my promiscous pollination project. Some seeds may have been pollinated by other wild species, or by interspecies hybrids. Indeterminate. Pinch of seeds. Small Grains I only offer hulless varieties of grains. That is because I think that we should be able to grow, harvest, and cook food using ony human scale tools and methods. The grains that I offer are easily harvested, threshed, and cleaned using only the human body. Gloves, sticks, tarps, secatueurs, and buckets might help with some tasks, but they are totally optional. These may planted in early spring or late fall. 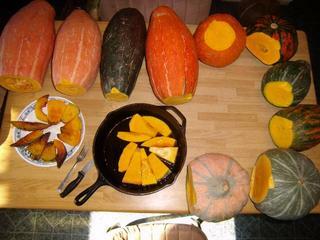 Fall plantings tend to produce an earlier and more abundant harvest. 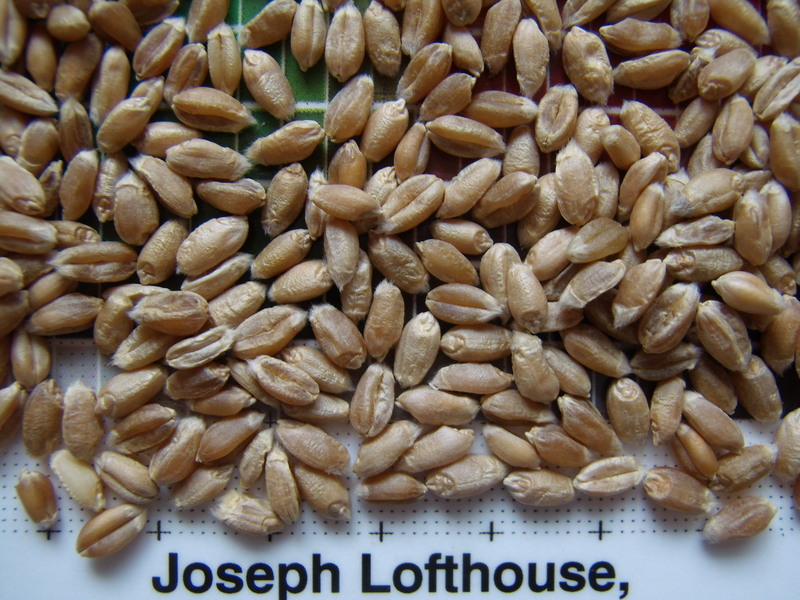 If you grow any of my grains, please consider joining and/or submitting grow reports to the Rocky Mountain Heritage Grain Trials Project being conducted by the Rocky Mountain Seed Alliance and collaborators. Originally collected along about 40 miles of back-roads in the northern Utah wheat growing belt. Landrace. Grows about 4 to 6 feet tall. This would make a great thatching straw. Can be grown as a spring crop. For best results, plant in late summer or early fall. Selection criteria included: Growing feral without irrigation or cultivation; Ease of threshing; Less shattering. Selected by Joseph Lofthouse. Plants grow 4 to 6 feet tall making harvest a joy. 1 teaspoon, ~150 seeds. A family heirloom that was developed on my family's farm by my great-great-grandfather. It was first released in 1890. The family story is that James was walking through his wheat field and noticed one plant that was growing better than any of the others. 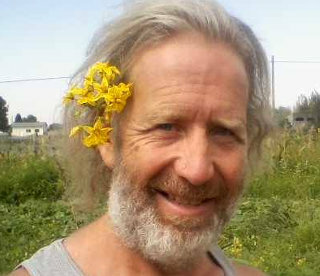 He marked it and saved seed from it to grow in his home garden. At one time, it was the most widely planted wheat in Northern Utah and Southern Idaho. Can be spring planted. For highest yield, plant in early fall. Bred by James Lofthouse in the 1880s. 1 teaspoon, ~80 seeds. An ancient landrace variety from Iraq. Triticum polonicum. Tetraploid. The first time I grew this variety, I felt startled by the huge heads and large seeds. Very productive in my garden. Hullless, and threshes easily. This seed was collected from plants sown in the fall. May be planted in spring or fall. 1 teaspoon, ~50 seeds. Hulless oats. To maintain varietal purity and good agronomic and culinary traits, I recommend only replanting seeds that thresh easily. Seed heads are about waist high for easy harvest. I recommend spring planting. This variety has survived the winter for me, with significant die-off. 1/2 teaspoon, ~70 seeds. Very productive in my garden. 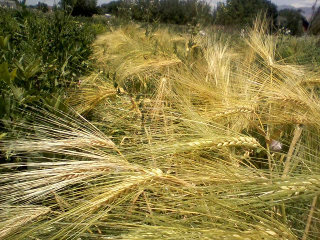 Short plants requiring stooping during harvest. May be planted in spring or fall. This seed was collected from fall sown plants. 1/2 teaspoon, ~40 seeds. 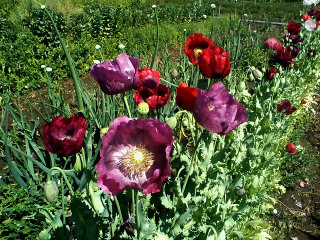 Papaver, somniferum. Not for sale, but I'll include a packet as a gift if I'm already sending a packet of something else to you, or if you send me a first class "forever" postage stamp. Commonly used as a garden flower, for floral decorations, and to add a great taste to baked breads. These have a glorious flower which is very attractive to honeybees. Annual. Spinkle seeds on ground in late fall or early spring then stomp to get good contact between seeds and ground. Packet size is approximately 1/16th teaspoon. Plants about 3 feet tall. Perennial and winter hardy Tiny pinch of seeds. Germinates quickly at 85F. 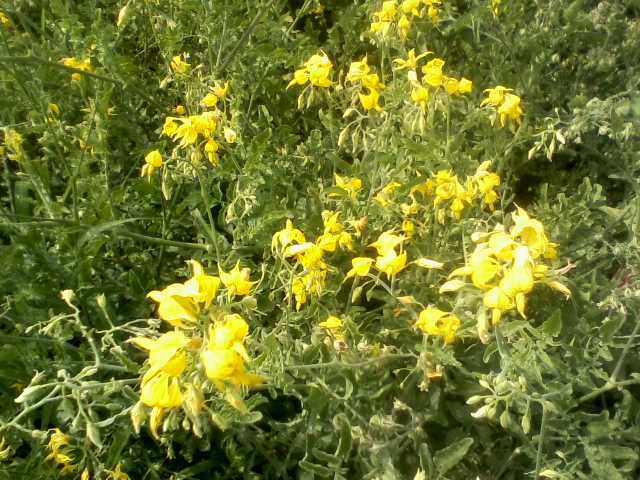 A drought tolerant perrenial plant with bright yellow flowers. This seed was wildcrafted in Avon, Utah in the summer of 2018. This seed requires 3 months of cold/moist stratification, therefore, I recommend planting it in the fall. Seed originally collected from the wild strain in this area. 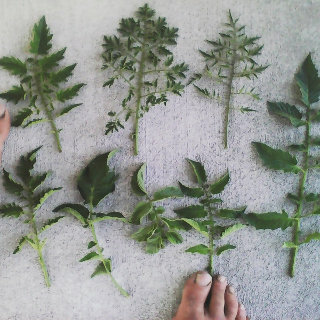 Plants 3 to 7 feet tall. Germinates slowly, about 3 weeks at 85F. Perennial and winter hardy. Small pinch of seeds. 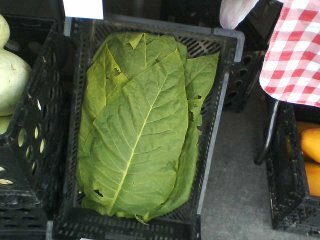 The leaves on this variety are huge. That simplifies picking and drying single leaves. The plants grow about 6 feet tall. 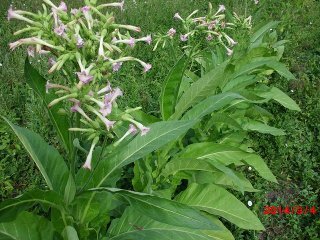 The flowers on tobacco are beautiful and showy. The combination of huge leaves, tall plants, and bold flower display make this a great plant to use for ornamental purposes. It is used by people in my valley for medicinal, veterinary, and pesticide applications. I'm not a smoker, so I'm not qualified to write about using it that way. I set out transplants, that I grow about like tomato plants, but I start them a bit earlier because tobacco seeds are so tiny. Go easy on the seed when planting. A little bit goes a long ways. Packet size is a small pinch, which might be around a couple hundred seeds. I prefer this variety for ceremonial use. Plants grow about 5 feet tall in my garden. If the plants are chopped off at about 4 feet tall, they send out a profusion of new shoots that are easy to bind with thread for making smudge sticks. Packet size is a small pinch. 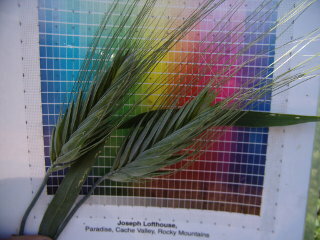 A grex of dual purpose flax varieties that work for seed and/or fiber production. They make a beautiful decorative flower. 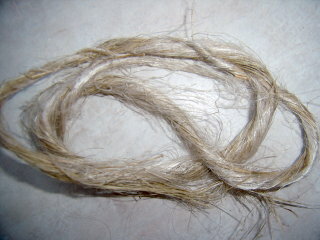 I consider flax to be a high-priority crop because of the rich abundance of omega-3 oils produced by the seeds. In my garden, flax is not as productive as Clary sage, but I grow both rather than put all my hopes into one crop. Grows about 3 to 4 feet tall. 1/2 teaspoon. A promiscuously pollinating grex of kale. 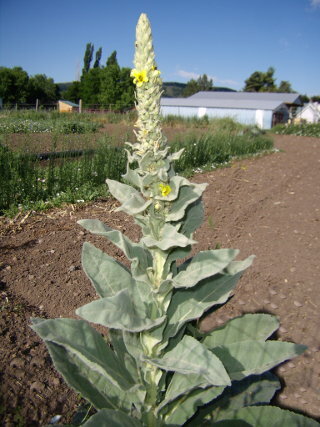 Brassica oleracea. Two generations of ancestors to these seeds survived the winter in my USDA zone 4/5 garden. 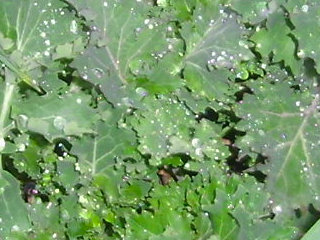 I highly recommend planting kale in late summer for harvest of greens in the fall, and early spring. The flowers and buds are a delicacy. If planted in about September, just before the arrival of fall rains, this can be grown as a non-irrigated crop in Cache Valley. 1/4 teaspoon, >200 seeds. The beginnings of a project to adapt Bok/Pak choi to my climate. 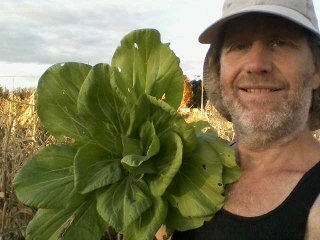 A promiscuously pollinating grex of every variety of open pollinated (non-male-sterile) bok and pak choi that I could get my hands on. I highly recommend planting Bok Choi in late summer for fall greens. Some of this population is winter hardy, but I haven't specifically selected for that trait. 1/4 teaspoon, >100 seeds. 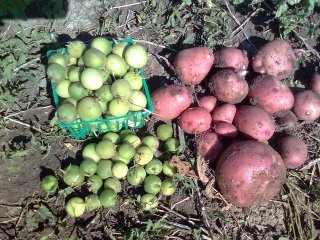 A mix of the most prolifically fruiting potatoes on my farm. Potato seeds germinate better in cooler temperatures, so starting on a heat-mat is not recommended. I highly recommend starting potato seedlings via the wintersown method. If starting indoors, I recommend sowing in 1/2" shallow soil, and adding soil to the pot as they grow. Or transplant the seedlings several times during early growth to bury the stem. Sprout in direct sunlight or under very bright grow lights to keep stems from getting spindly. Start indoor transplants no more than 6-8 weeks before planting out, just after the last spring frost. Because of my decision to eliminate cytoplasmic male sterility from my garden and to not spread it to others, I am only offering seeds rom abundantly fruitful potato plants.. ~50 seeds. 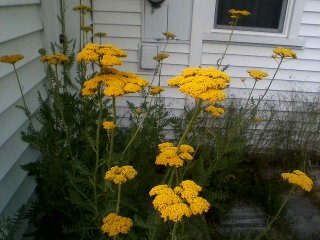 This has been growing feral on my farm ever since I grew my first seed crop. An open pollinated variety with limited genetic diversity. It does well here, so why mess with a good thing? 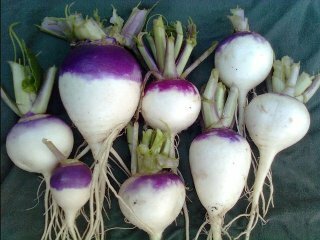 I really like planting this mid-summer for a beautiful fall crop that mostly misses the common turnip pests. 1/8th teaspoon, ~200 seeds. Egyptian Walking Onion Bulbils Out of bulbils for sharing. I'll have potted plants at the farmer's market. This variety was collected from the yard of my great grandfather before I was born. Bulbils are susceptible to freezing in transit during super cold weather, so I don't expect to ship them after mid November. I don't ship these to Idaho. Please don't request these if you are in other localities that prohibit import of onions for planting. 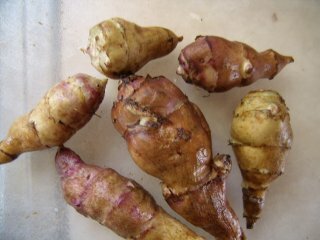 Clones/cuttings/tubers of this variety are available. Shipped only during warm weather. I'll delay shipping until the weather warms up. If requesting this variety, please add $8 for shipping, which will cover shipment of several different kinds of cuttings/clones/tubers. Lofthouse Sunroots (Helianthus tuberosus) originated as a cross between an improved population of feral sunroots collected in Kansas, and a commercial clone. They have been selected for vigor, productivity, and good agronomic and culinary properties like ease of digging and cleaning, larger seeds, bigger flowers, shorter stolons, larger tubers, etc. Because they are a genetically diverse population they set seeds prolifically, weather permitting. Collecting lots of seeds may require bagging the blossoms soon after petal drop to prevent predation by birds. This variety was developed for subsistence level growing without the use of fertilizers or cides. They are winter hardy in a cold mountain valley in USDA zone 4b. Sunroot tubers are very susceptible to dehydration, so roots are best stored in soil, or refrigerated in plastic. Plant seeds about the time that apple trees are blooming. Sunroots stored overwinter in the ground can be harvested whenever the soil isn't frozen. I typically cut stems off about a foot high in early winter to prevent winds from levering the tubers out of the ground. These are reliably winter hardy in USDA zone 4b. Bred by Joseph Lofthouse. OSSI-Pledged. Cactus The varieties of cactus listed here have been winter hardy in usda zone 4b for more than 9 years. Winter survival is best on cactus grown in well draining soil. My formula for cactus soil is 70% sand, and 30% compost. Prickly Pear Cactus, grown for the tasty fruits. Germination about 25% after 3 weeks at 85F. I have had good success germinating cactus seeds by putting them in a jar with an inch of wet sand. Then transplanting them to pots after they have sprouted. Cactus grow best if given plenty of water while young. I plant them in sand, and irrigate every day, during the summer, when watering the rest of the greenhouse plants. Then let them dry out in the fall. ~20 seeds. Opuntia polyacantha. 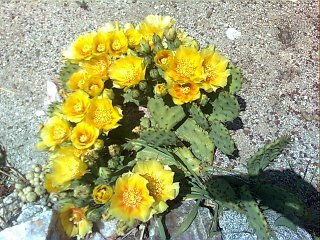 The most common native opuntia in my area. I eat nopales from this species if picked young. I consider the fruits to be unpalatable. This variety has lots of big spines, and is very resistant to predation by animals. 2 pads. Opuntia humifusa. Eastern Prickly Pear. This is the variety of prickly pear that I harvest as nopales for my farmer's market and local restaurants. It produces an abundance of nopales, and bright yellow flowers in the spring. It has a few large spines, and many tiny spines. It is not suitable for growing in the badlands, because it easily succumbs to predation by animals. In my climate, the fruits don't ripen sufficiently to be palatable enough for my liking. 2 pads. Cylindropuntia imbricata. Also known as tree cholla. The spines on this variety have a hook, so it's the fiercest cactus that I grow! Flowers have been indistinct in my garden. 2 cuttings. 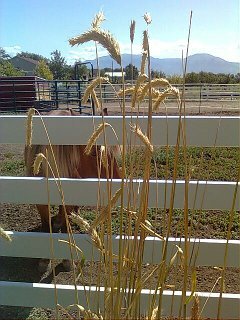 Seed collected growing feral in non-irrigated places in Cache Valley. Phenotypically diverse. Quick germination at 85 F. 1/8 teaspoon. I only posted the most glamorous and abundant seeds to this list. If you want other seeds, scions, or cuttings, or things from my breeding projects, or that I could collect from the wildlands, send me a message. Because they are small seed lots, and experimental, I don't do germination testing on seeds from the wildlands nor from my breeding projects other than planting them for my own use. I am thankful for the donations of seed, equipment, and funds that have made it possible for me to develop so many glorious varieties. I love the tastes, smells, and colors of the vegetables. I am thankful that being a subsistence farmer, and living under a vow of poverty, allows me to donate tremendous amounts of food to those in need. I love you for your ongoing support and encouragement, as we collaborate together, to enhance food security through common sense and traditional methods. Some of my varieties are experimental, or I only have a little bit of seed to share, or they did not meet my germination standards, testing at about 40% to 74%. Or I haven't got around to doing germination testing yet. (I'll move them to the regular list if I do testing and it's great). Low germination might be because I tested under the wrong conditions, or because the seed has low viability. Heirloom apricot seeds -- breathing on the mother bruises the fruit. Taste is fabulous! Locally Adapted Landrace. Great biodiversity and well adapted to my garden. Phenotype fairly consistent from year to year. A grex: Mixed cultivars and heritage. Not grown long enough in my garden to be considered a landrace. An open pollinated (inbred) variety. Low genetic diversity. By Mail: To obtain seed samples send one silver dime, dated 1964 or earlier, to my post office box for each variety desired. That was the retail price of a packet of seeds in 1860 when my great-great-great grandmother started farming in Paradise. I'm still farming in the same village and asking the same price more than 150 years later. I accept other denominations of silver coins dated 1964 or earlier, and modern silver eagles that are 0.999 fine. Include four dollars cash per shipment to cover the shipping costs. [Please, if you send anything other than paper put it in a padded or bubble envelope, or tape dimes securely to a piece of cardstock inside an envelope.] Silver dimes are readily available at pawn shops and on eBay. My vow of poverty precludes me from having a bank account so I don't accept checks nor electronic money. Frugal shoppers will notice the bargain pricing available for paying with silver (real money). If you don't want to put in the effort to use silver, I will also accept $5 cash per packet. My mailing address is in the photo at the bottom of this page. In person: Drop by the Farmer's Market in Logan, or look for me at seed swaps during the winter. 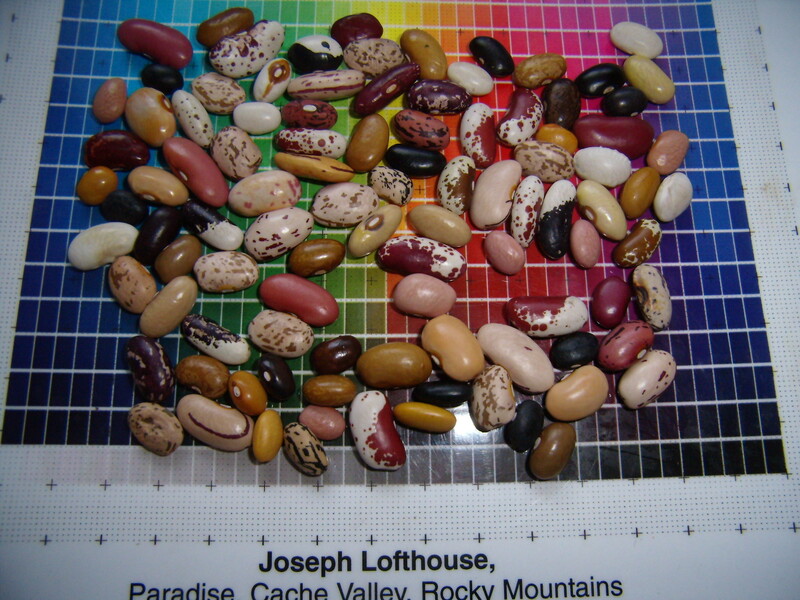 I am attending the NOFA seed swap in New York in January, the Rocky Mountain Seed Alliance swap in Santa Fe in February, and the Ogden Seed Exchange swap in Utah in February, and the Cache Valley Seed Swap in about March. By Donation: If you have experienced a disaster or family emergency (such as unemployment, flood, or divorce) let me know about it. I'll put together a package of seeds for you: My choice of varieties, whatever I have too much of. It might even include commercial seeds that I don't expect to plant. By Swap: I would be glad to swap for any of the following seeds, especially if they are from your own breeding projects. Unless specifically stated, I do not want commercial seeds, and especially not seeds with poison on them. On swaps, I ask that you pay the postage going both ways. I get so many requests for swapping that I can't afford the postage. I end up gifting most of the seeds that I receive in swaps to local seed exchanges or collaborators, therefore I am rarely able to give grow reports. Other dryland suitable vegetables, medicinals, herbs, or flowers that I'm not currently growing, if you grew the seed yourself, or know the name of the specific human that grew it. In other words, I want to foster human to human interactions, not customer to corporation. Tell me a story about the species and it's grower. I might be enticed to accept it in swap.